Endeavour continues to close the distance between herself and the International Space Station (ISS), as Flight Day 2 activities – focusing mainly on the Orbiter Boom Sensor System (OBSS) scans of the orbiter’s Thermal Protection System (TPS) – have been concluded. Flight Day 2’s activities included rendezvous preparations for docking with the ISS, involving centerline camera installation, EMU spacesuit checkouts, docking ring extension and rendezvous tools checkout. However, the primary focus of FD2 has been the inspections of Endeavour’s TPS. Evaluations into Endeavour’s ascent have been continuing since her launch from the Kennedy Space Center (KSC) on Friday, with a team of engineers on the ground trawling through vast amounts of data and imagery. So far, only one or two items of interest are being looked at, which will be cross referenced with the TPS scan data. One event, during early second stage flight is yet to be clarified, and may be removed as an item of interest. The other relates to an event at T+33 seconds, where launch video shows an object that may be related to an area of interest below Endeavour’s left OMS Pod. Engineers initially believed they had spotted a what appears to be a missing strip of thermal blanket – measuring 4 inches wide (height) by 12 to 18 inches (long). This area has no primary thermal heating concerns of note for re-entry, though managers decided to ask the crew to take a closer look during the OBSS scans. Imagery gained via the short focused inspection by the OBSS is proving to be inconclusive at this stage, though the current thought is the T+33 event is the strip of blanket liberating from Endeavour. As with every mission since Return To Flight, ascent imagery, radar, and onboard cameras provide the opening salvo of data for engineers to check over. Flight Day 3’s RPM (Rbar Pitch Maneuver) finalizes the full overview of the orbiter’s TPS health, before the teams of engineers can conclude their evaluations. 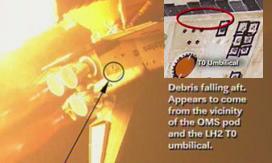 Opening data include downloaded imagery from the External Tank (ET) umbilical well, located on the belly of the orbiter. This is required to gain an insight into ET-129’s performance during ascent, including the pinpointing of where any observed foam liberation shed from the tank. The whole process – carried out by the Damage Assessment Team (DAT) – can take up to five days. Flight Day 3’s RPM – Rbar denoting along the radius vector of the ISS, downward – allows the ISS crew to perform a high resolution photo survey of the lower surface thermal protection system (TPS) tiles to screen for ascent debris damage. The nine minute maneuver – which sees the orbiter commanded through a 360 degree back-flip – was debuted on STS-114’s Return To Flight mission, following months of planning by shuttle experts at the Johnson Space Center (JSC). Once the RPM is complete, Endeavour will move on to the next milestone, which will result in docking with the ISS around 4pm Central time. Interestingly, an anomaly with Endeavour’s KU Band Antenna electronics may come into play during Flight Day 3. The Antenna is suffering issues when in GPC acquisition mode, which prompted controllers to call for the use of the alternative mode of GPC designate. Two issues exist with the KU, one relating to KU to S-Band handover and the other with angle tracking. It is currently unclear if the electronics issue relates to the part of the box that is also responsible for Endeavour’s radar – which is used for approaching the ISS. Should the radar be affected, Endeavour will utilize the star tracker. There are certain limitations via this alternative option, as the star tracker only provides angle data, whereas the radar provides range and range rate (known as rdot) as well as angles. Crews are trained for such scenarios, where they will be required to monitor the system more closely than usual. This is due to the star tracker being an optical device, which will see the ISS as a “star” as the two vehicles close in on each other. That in itself will give Endeavour the required point – or vector – of reference. However, the main concern is that a celestial object (i.e. star, planet, etc) would pass through the field of view near the station and cause the star tracker to lock onto the star instead of ISS. It is not yet clear if the radar won’t work as advertised, with confidence rising that the electronics issue with the KU Band Antenna system won’t prove to be related to the radar, following self test diagnostics that were sent up by controllers on the ground. 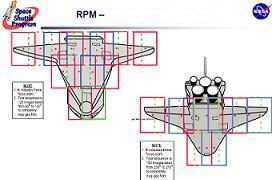 Should the KU malfunction only relate to angle tracking, the crew could use radar range and rdot data simultaneously with star tracker angles. Importantly, the issue has no mission impact, as managers finalize plans to extend STS-126 by one additional docked day, based on encouraging data on Endeavour’s consumables.